A senior member of the Jedi Council Mace is a highly revered Jedi Master. He is a diplomat by nature and seeks peaceful solutions to most volatile issues. However, with thousands of solar systems threatening to secede from the Galactic Republic under the leadership of Count Dooku, Mace believes the time has come for swift action. 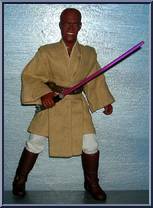 Contribute pictures, update details or suggest corrections for Mace Windu (Jedi Council). Write a review about Mace Windu (Jedi Council).